Have a 2019 NorthStar Laredo SC and did go over it when we picked it up at the dealer. Everything worked, looked neat and clean, looked over the roof from the ladder, etc. Not perfect, but nothing ever is. Now it's up on the jacks and I am planning to route a cable outlet next to the 120 VAC receptacle outlet on wall. Have the fridge vent cover off and note the propane line now run in hose rather than copper is tight against the fridge stack. is that hose heat resistant enough to be positioned against the stack that hoses the elements and the propane burner? I don't know, but it seems wrong and there is plenty of hose so I just rerouted it. Seems like a fire hazard, particularly if the cooling coil leaks and fridge doesn't shut off. I can't answer you question regarding the routing of the gas line but, if I were you, I'd call the manufacturer and express your concerns and your remedy. My question was more rhetorical. I am not worried about moving it as there is plenty of clearance, more than enough hose, and it is decades since my first rodeo. What I find most often is things like plumbing and wiring are not done with enough care or in a way that makes sense. Often wastes material and space. Beginning to wonder about Northstar quality control. I have a (model year) 2018 Northstar Arrow-U. It was a custom order thru Truck Camper Warehouse in NH. I had to wait 6 months for build & delivery. Once I got the new camper home everything that could possibly be taken apart and inspected did get taken apart & inspected! The few places I couldnt get ripped apart to inspect I got into with a bore-o-scope camera. There were numerous things, small things, I was not pleased with so I re-did them to my own liking. Plumbing upgrades, electrical modifications, wire routing, minor structural improvements, etc... Mostly tidying up the existing factory work (which wasn't really that bad). I consider all the above work normal & necessary when bringing home any new RV. Moving your propane hose away from that heat source was a good idea. If I had your new Laredo SC, I would make it a point to look a bit deeper into the nooks & crannys for things that could be tidyed up and improved. I think that the more you look around the more you will find. Overall I felt the Northstar was very well built and would buy again. I'm considering buying a Liberty. 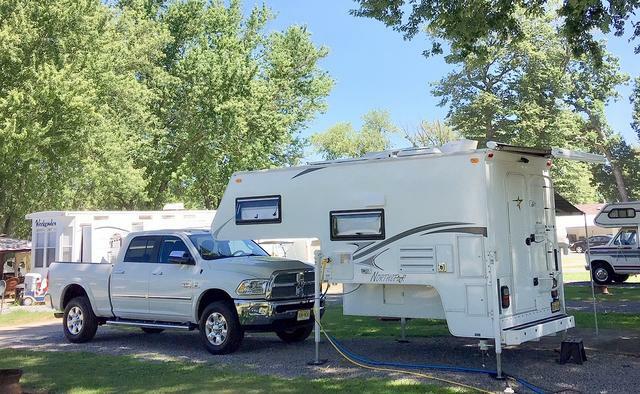 The $70,000 truck sitting under my camper in the picture below has far more problems than my trusty Arrow-U. I only wish Dodge/RAM could build a product as well as Northstar does! I pretty much did what you did with yours. Mostly I was impressed. I was not impressed with the rubber roof. One side was pulled tight and fastened under the trim the way it is supposed to be done. The other side is not pulled as tightly sloppy workmanship. I should have walked the entire roof rather than just climbed the ladder and looked from the end. From working on RVs, I know this is a common thing, but somethings are so basic -. The propane line was not a big thing and easy to correct, but again I felt like it was sloppy workmanship. Overall I think our NorthStar is a good value, but not a perfect camper. Like you, I am doing a few mods. Finding a NorthStar was really a bear. We considered Truck Camper Warehouse. I know they have a great reputation, but they were so much higher in price and a much longer drive, so we went with Southland just outside of Nashville. It all went without a hitch there. Before buying I emailed back and forth with their sales manager, Billy, and also talked with him on the phone. Haven't talked to Rex. Really don't plan to. Anything short of a structural issue, I can deal with. Right now my wife and I are trying to plan what we want to use for steps. Don't want Glow Steps and already have a couple sets of scissors, but want to do something to carry our genny and get us up into the camper without making an eyesore. I pretty much did what you did with yours. Mostly I was impressed. I was not impressed with the rubber roof. One side was pulled tight and fastened under the trim the way it is supposed to be done. The other side is not pulled as tightly sloppy workmanship. I should have walked the entire roof rather than just climbed the ladder and looked from the end. Overall I think our NorthStar is a good value, but not a perfect camper. My Arrow-U's roof membrane had a few spots I was not happy with but I talked to TCW about it and decided it was minor and just accepted it. I came very close to buying a NorthernLite but the smaller (and narrower) size of the Northstar was the clincher. I bought the Northstar. No regrets. I use the GlowSteps on my Arrow when it's on the truck and no steps when it's off the truck and sitting down low. Speaking of generators. . .
During the cooler months I use the built-in generator box on the Arrow-U. It conveniently holds a propane powered Honda EU2000i. During the hotter months I carry a gasoline powered Predator 3500 on a swing-out tail mount. Main reason is the 3500 watt Predator generator is tremendously quieter than the Honda EU2000i. I plan to make a short video of the swing-out generator mount soon as the weather here dries up a little. Perhaps it will give you some ideas. 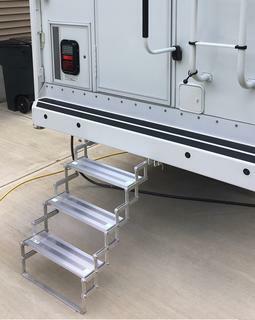 Please let me know if you find camper steps that are better (easier) to live with than GlowSteps. Man, were we on the same page! We also went back and forth on Northern Lites, but wanted a smaller bodied camper. We use a Yamaha 2000 inverter model and works well. We try not to use it at all if we are around other campers. I will be anxious to see what you do with the swing-out. I am probably going to fab up something for the steps. Man, were we on the same page! We also went back and forth on Northern Lites, but wanted a smaller bodied camper. I will be anxious to see what you do with the swing-out. I am probably going to fab up something for the steps. Now this is nuts. The Thetford cassette toilet in our new Laredo has a fancy door on the outside to empty the tank. It has a unique lock, but only comes with one key. So off I go to the local locksmith who has been making keys for me for years for "you name its". He doesn't have the key blank that matches. All along I was thinking the original set of two keys must have lost one in shipping or some such, although I did find searching the Internet that the "one key" scenario was not unknown. Next I called Thetford customer support to share my wish to have two keys since losing the only key could cause a problem, if we could not empty the tank without forcing the door. Without missing a beat James on the other end of the line advised me that their cassette commodes only ship with one key. His advice was, since the key blank is for a Triumph motorcycle, they recommend searching the Internet to find the correct blank (and no, a standard RV hatch lock will not fit the cassette door). Not the easiest thing to do as Triumph motorcycles have more than one blank, but the key I have has a series of numbers on it and searching I found what I think is the correct key on eBay. I will see if I am right when it gets here Monday. The thought did pass through my head however "what kind of company saves money by only issuing a single key to anything". Oh yeah, I forgot, truck campers are RVs. I should have expected it! James on the other end of the line advised me that their cassette commodes only ship with one key. His advice was, since the key blank is for a Triumph motorcycle, they recommend searching the Internet to find the correct blank (and no, a standard RV hatch lock will not fit the cassette door). The thought did pass through my head however "what kind of company saves money by only issuing a single key to anything". Oh yeah, I forgot, truck campers are RVs. I should have expected it! I never knew any of that! Thank you for passing that info along, and please keep us posted! Here's an update. Triumph keys are reversed, they don't go in the Cassette lock. However, if you go to eBay and type in "Thetford Key", a number of choices come up. You then select the code number on your key from a drop down screen and if you are lucky it will be there and you can order it from the United Kingdom or Australia. I wasn't lucky, but even if I was, not all sellers will ship to the United States so you may have to check. The exchange rate currently is 1 pound = 1.31 dollars plus shipping. However, in reading the Caravan forums from the United Kingdom I noted the standard procedure when a cassette key is lost is simply to jam a screwdriver in the lock and turn. One forum member said you can use almost anything in the lock to turn it (although I am not sure that would be good for the lock). If you search YouTube and you will also find a couple of ways to make duplicates from your original key and that may be the simpler way to go. Just don't lose the key until you have the duplicate made.